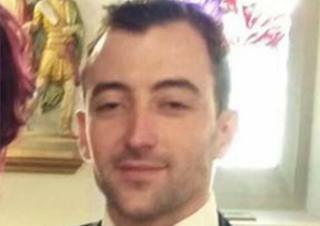 The man who died after being hit by a car in Toome, County Antrim, on Sunday night was 28-year-old Diarmuid McFall. Police said the incident happened close to a service station on the Moneynick Road at about 20:20 GMT. Mr McFall lived in the area. Meanwhile, in County Louth, two men in their 20s, believed to be from County Down, have died following a crash shortly after 00:30 GMT. They have been named locally as Marty Patterson and Shane McAnallen. It is believed their car left the R173 Newry Road in Carlingford and went down an embankment. Broadcaster RTÉ reported that gardaí (Irish police) had attempted to stop the vehicle prior to the collision. A Garda Ombudsman investigation is under way into the incident. Bryansford Gaelic Athletic Association football club posted on Facebook that the men had been past underage players and everyone was in a "state of shock". In the same message, they sent condolences to the family of Ruth Maguire, their underage coach. A body was recovered from Carlingford Lough on Monday afternoon during the search for the County Down woman, who went missing during a hen party.